24 brand new levels to master in the agile new PICKUP TRUCK! This is the AD-FREE version of Trucker. Other features are the same. Take control of your trucks and prove your driving skills in Trucker: Parking Simulator. • TONS of content, with extras to unlock to extend your Trucker experience! • NEW - FREE Pick-Up Truck with 24 brand new levels! • Free-drive 'sandbox' mode. Learn your craft here! • Realistic physics, accurate handling and finely tuned controls for an exciting, challenging drive! • Full 3D world to explore! • Universal App. Optimised for anything from iPad 1, iPod Touch 4th Gen, with full iPhone 5 widescreen support. • Compete on the world leader boards or against your GameCentre friends for top scores! • Analogue wheel, on-screen buttons or tilt steering with on-screen pedals. • Manual or automatic gears. • Set steering sensitivity for all modes to find the perfect control method. • Separate leader boards for each truck and mode. • A level playing field where your skill will win! 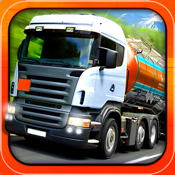 • Race and compete to be the best Trucker! • 56 Achievements! Get 660 GameCenter points! • Unlock extras within the game to extend your Trucker experience! • Monster Truck - can you handle 36 levels in the longer and faster Monster Truck?! • Kids Mode - a shorter truck and more time makes an easier drive. • Unlock all levels - stuck? Jump ahead with this unlock! The extras are in no way required to complete all levels using the Oil Truck. It's more like a bonus DLC if you like the game, to get an extra vehicle for a new challenge once you complete the original levels, or if you want to make any truck easier with Kids Mode. Take your time, don't hit anything and you will make it in time. As you learn your vehicle you'll get more confident and faster. Use Free-drive Mode and set yourself some challenges to learn the handling. Use the cameras and get a good view for reversing, then practice until you can reverse smoothly in 1 motion accurately. This is all done with the default content (Oil Truck, Normal levels).